Follow these simple steps and that ideal property in Slovakia will be yours. Before you fly out to Slovakia, spend plenty of time researching the market online. Go through all of the information in the Slovak section of this site and then start looking for developers, agents or individual properties that look as if they might be interesting. The Slovak Listings section of the site is probably the best place to start your search, but also check out the advertising in this section, and look at the Directory to get some more contacts. Although it is possible to arrange financing in Slovakia through a Slovak bank, you will probably find it a lot easier to obtain financing in your home country, perhaps by re-mortgaging your current property or properties. Another option is to discuss the possibilities with a mortgage broker who is based in your home country and has experience of arranging mortgages on property overseas. It is advisable to do this before heading out to Slovakia so that you have a firm idea as to what your maximum budget is going to be. If you spend all your time over there looking at properties around EUR150,000 and then come back and find that the maximum amount you are able to finance is EUR100,000, your time will have been wasted. 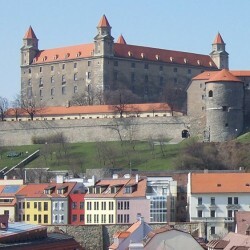 Use the Budget Flights Tool to work out the most affordable way of getting to Slovakia and then head out there to look at those properties that look most interesting for you. Check the properties, or the locations if you are looking at an off-plan property. Don’t just check the properties themselves; check out the areas that they are located in as they will all be new to you. Ask plenty of questions. Across much of Eastern Europe, hiring a lawyer to oversee the purchasing process is ‘recommended but not obligatory’ because it is notaries that do most of the work in terms of checking title deeds and arranging the transfer of ownership. In Slovakia, however, this is not the case – only lawyers create the contracts. This means that there is no real way around the situation – you are going to need a lawyer. As it is vital that you find a lawyer who is representing your interests and your interests alone, don’t ask the real estate agent or developer to recommend one – it’s better to choose one yourself. You can find details of Slovak Lawyers in the directory section. One other advantage of using a lawyer is that, by giving them ‘Power of Attorney’, they will be able to sign legal documents on your behalf. This can offset some of the costs if it means your having to make one less trip to Slovakia in order to complete the buying process. Fortunately, the costs for lawyers in Slovakia are pretty reasonable when compared to most other territories. You can reckon on spending around EUR1,575 in total on legal fees, which includes the cost of land registration and registering with the Slovak tax authorities. Whereas in markets such as the UK, the initial price is known as an ‘asking price’, with both the buyer and seller expecting the final sale price to be somewhat lower than this, don’t expect the same in Slovakia. There’s no harm in trying to negotiate a reduced price, but sellers here usually expect to get the full amount. Make sure you know exactly what costs are covered in the final selling price to avoid any nasty surprises further down the line. Typically, the seller should be responsible for paying 19% VAT and perhaps the estate agent’s commission (which is probably going to be in the region of 5% of the total). Sometimes, however, the seller will try and split the commission, however, so you really do need to check this first. You, as buyer, will be responsible for all of the other buying costs as detailed below. If you haven’t already arranged financing in your home country, you need to arrange it locally. If you’re going to be buying off-plan, then check with the developers to see if they can recommend a local bank. If not, you’re on your own. Check out the links to Slovak Banks in the directory section. The process of obtaining a mortgage in Slovakia from a bank is going to be similar to that in your home country. They are going to see some proof of income before committing to a loan, so make sure that you bring all of your important documents with you to a meeting with a bank. Expect to have to wait for a minimum of a week or two in order to get a final decision from the bank, perhaps longer. In order to get a mortgage, the bank will require that you get an official valuation of the property’s worth, which can cost EUR300 and they will require an arrangement fee that varies from 0.3-1.0% of the purchase price. If you’re buying an off-plan property, then perhaps the developer will require you to sign a reservation agreement before you get to this stage, but the main document is an initial contract that will be drawn up by your lawyer on your behalf. This is a formal, legally-binding contract which contains all of the key information about the agreed deal including the details of the property, the total amount payable, the deposit, penalty clauses, etc. As with all contracts in the Slovakia, this will need to be signed in front of a notary. Immediately that the agreement is signed, the buyer will pay a deposit – usually around 10-30% to the seller. While your lawyer is checking the status of the property, you will now have a certain amount of time to inspect the property. It is not so common in Slovakia to request for a surveyor to make a full structural report on a property. If the property has been built recently, then a survey should not be necessary as the building will be under guarantee from the builders. Check the property out yourself. Chances are that it will be OK, but if you see anything that could cause you sleepless nights, then perhaps it is worth the money to get the property checked out first. You can find details of Slovak Surveyors in the directory section. The final contract is signed once your lawyer has carried out all of the necessary checks and searches by checking the Kataster (Land Registry) which shows the ownership of all property in the country and the seller has provided all of the relevant title documents, permissions for use and information on any mortgages and loans outstanding. As always, your signatures will have to be notarized. In total, you can reckon on paying around EUR100-150 in notary fees and to get copies of all official documents translated into English. And naturally you are also going to have to pay the balance of the cost of the property itself. Usually this is paid via your lawyer who keeps the money in an escrow account until you are officially listed on the Kataster. This process usually takes 30 days, but for an additional payment of around EUR200, it is possible to get ‘fast track’ registration in just 15 days. Congratulations! You’ve just bought yourself a property in Slovakia! That wasn’t so difficult now, was it? !